Hello, Rice Lovers! It’s time to rejoice. 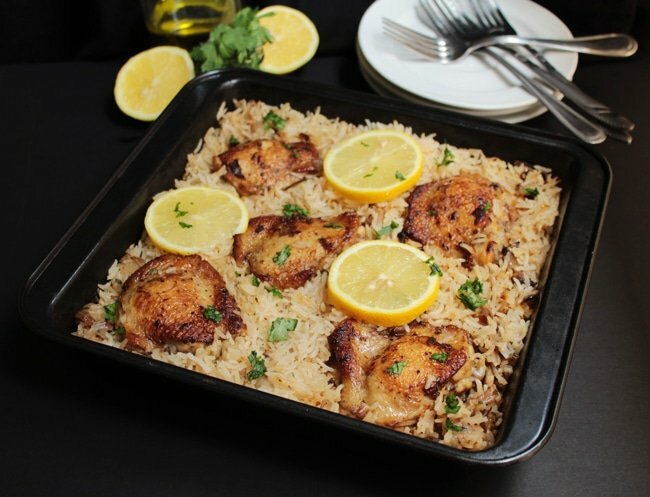 This dish is sure to satisfy your rice loving taste buds.The chicken thighs are seared off in a pan and then finish cooking on top of the rice in the oven. 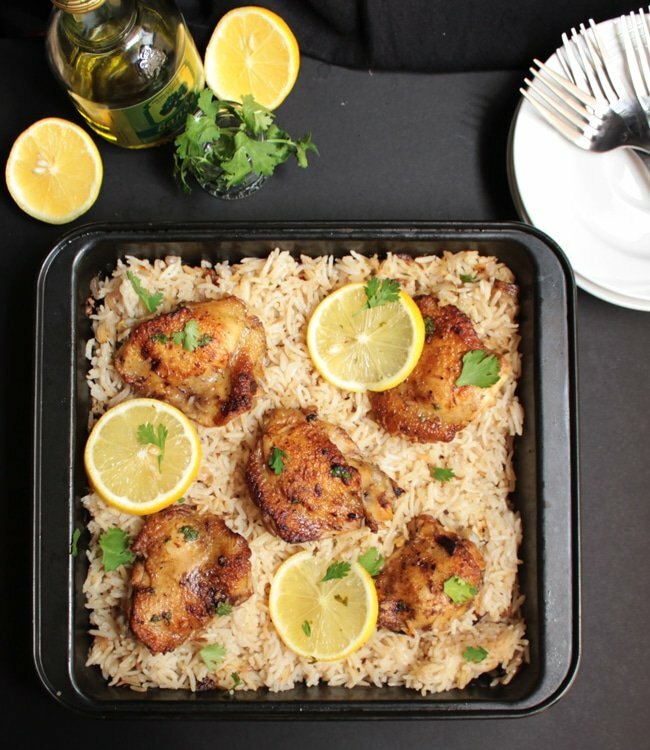 Imagine all the juices and flavor of the chicken thighs being soaked up by the rice. Yum! When I first saw this recipe on Nagi’s blog RecipeTin Eats, I knew I had to try it out. Any dish that involves rice, I usually try it out, because I’m Team Rice forever. But what really compelled me to try out this dish was the cooking method. See, in Pakistan the concept of oven baked rice is unheard of. The method of cooking rice in Pakistan is a serious matter and is done in a very particular manner. You can’t mess with the rice people in Pakistan. You have to boil the rice till the water is absorbed, and then put it on dumm (covered and on low heat). The dumm is done by placing a flat heavy iron skillet under the pot of rice and the pot is covered with a clean cloth and then covered with the lid. This is so that the steam is trapped in the pot and the rice is cooked without sticking to the bottom of the pot. I personally don’t use this method in my kitchen, but it’s close to my heart. Probably something to do with childhood memories of plates of fluffy steamy rice. That’s why I’m part of Team Rice. Bowl of freshly cooked rice + any curry = comfort food. It’s the perfect comfort equation. So anyway, when I saw this rice had to be baked, I really wanted to try it out and see if it really worked. And it did! It’s also a very convenient way to cook rice, and the flavor combinations for this dish are infinite. I’ve already planned to try out a chicken tikka flavor using this same cooking method. Stay tuned for that one. But these classic Greek flavors that are used in this recipe make for a delicious dish that is super easy to make. I’ve followed the recipe as it is, but changed the cooking method slightly. 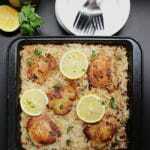 Nagi makes this whole dish in one oven proof skillet pan. I don’t have a skillet, so I made some adjustments to the method of cooking this dish. I used a frying pan to fry the chicken, then I cleaned the fat and chicken bits, just like Nagi does. Then I fried the onion in the pan until it was translucent, added the rice ingredients, including the chicken stock and let it come to a gentle simmer. Then I poured this this brothy rice goodness into a 9 inch baking pan, covered it with foil and baked it for 10 minutes. After 10 minutes, I uncovered the baking pan and let it bake for another 35 minutes according to Nagi’s instructions. 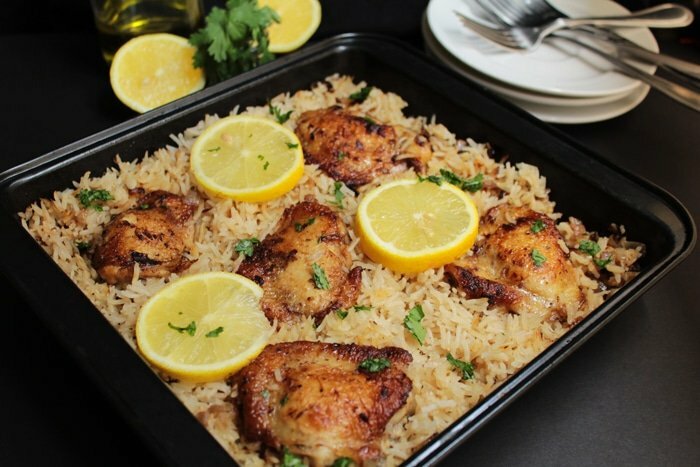 I do hope you try this dish, so that you can see how delicious the rice is after its soaked up all of the chicken juices and flavors. Seriously, no flavor wasted here! Combine the Chicken and Marinade ingredients in a ziplock bag and set aside for at least 20 minutes but preferably overnight. Take the chicken out from the marinade. Do not throw the marinade away, its got tons of flavor. Heat 1/2 tbsp olive oil in a frying pan. Place the chicken in the frying pan, skin side down, and cook until the skin is crispy and golden brown. Then turn and cook the other side until golden brown. Remove the chicken and set aside. Pour off the oil and fat from the pan, and wipe it clean with a paper towel. Heat 1 tbsp olive oil in the skillet over medium high heat. Add the onion and sauté for a few minutes until lightly pale and translucent. Then add the rest of the rice ingredients along with the reserved marinade. Remove from the oven and garnish with freshly chopped coriander. Note 1: If you don't have chicken broth just dissolve a chicken stock cube in 1 1/2 cups of hot water. Note 2: Nagi makes this whole dish in an oven proof skillet, so if you have one use that to make it a one skillet pan dish. But I don't have a skillet so I seared the chicken in a non stick frying pan. Then I cleaned the frying pan with a paper towel, fried the onion and added all the rice ingredients and let it come to a simmer. After this I shifted the rice mixture to a 9 inch baking pan, and covered it with foil and baked it according to Nagi's instructions. *Recipe adapted from RecipeTin Eats. This was truly scrummie!!☺. I tweaked a little in that I used a 3 grain mix – risotto, pearl barley and spelt. Added with the onion a small carrot and courgette chopped up (I don’t like the veggies chopped too small). Deglazed pan with half cup white wine then adjusted total amount of water. Cooked in one pan then covered in oven for about 25 mins. before taking lid off. Just before finished added a cup defrosted peas then back in oven for a couple mins. I wondered if the amount of oregano used might have been overpowering but it so wasn’t!! I just didn’t overload the tablespoon. I will definitely be making again and possibly try a few different vegetables in with the rice, celery, mushrooms, fennel possibly? P.S. so economic too☺. Thank you. I am trying this recipe. It looks delicious! However, the recipe I am looking at does not call for olive oil in the marinade. Could this be missing from the list of ingredients? 4 TB of lemon juice doesn’t seem like enough liquid?